It was partly a rhetorical question—we both know that some drivers just expect us to get out of the way on “their road.” Illegal to ride on the sidewalk? Not their problem. The door zone is dangerous? Still not their problem. The lane is too narrow to share? Tough. It’s “their road,” and you will just have to get out of their way. But what if the roads were different? 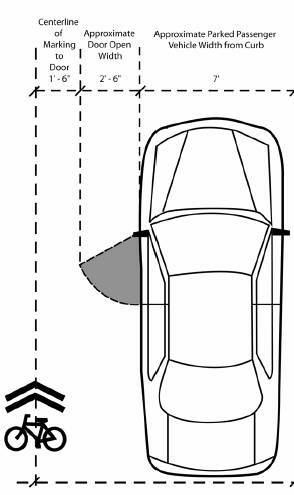 What if there were a visual cue apprising motorists and cyclists alike that cyclists are to take the lane, riding to the left of the door zone? Wouldn’t that be the final arbiter in the matter? This is the idea behind bicycle boulevards and sharrows. When a street has been converted to a bicycle boulevard or a sharrow, there’s simply no mistaking the fact that cyclists belong in the lane, because drivers (and cyclists) are apprised of this by the large infrastructure markings painted onto the road surface. With these markings in place, no driver can credibly claim that they “didn’t know” that cyclists are legally allowed to take the lane. They might not agree with the law, but they can’t pretend they don’t understand it, any more than you, as a driver or a cyclist, could get out of a speeding ticket because you didn’t see that 20mph School Zone sign. Further, in the case of sharrows, drivers can’t pretend to be doing anything other than violating the law if they attempt to force a cyclist out of their way. These road markings effectively turn the table on these outlaw drivers: Don’t want to share the lane with cyclists? Tough. Don’t drive here then. Of course, that raises the question of whether infrastructure creates a false impression that cyclists are only allowed where bicycle infrastructure exists. It’s quite possible that the presence of bicycle infrastructure on some streets implies that cyclists are not allowed on other streets (that don’t have bicycle infrastructure). Certainly some cyclists will argue this point. But the motorists who would believe that also believe that cyclists don’t belong on the road, period, even if there were no bicycle infrastructure and we were all just advised to take the lane. In fact, many of these motorists know full well that we have a right to our share of the road, but just don’t agree with the law. The absence of bicycle infrastructure only gives these scofflaws the cover they need to use several tons of fast-moving steel as “back-up” in asserting their own views. And the absence of infrastructure discourages most people from riding. In Portland, Oregon’s Bicycle Plan for 2030, the demographics for Portland’s citizenry is broken down into four categories : (1) the 33 percent of Portland’s population which, for various reasons, will never ride a bike, “no way, no how”; (2) those who would like to ride a bike in town, but are afraid to ride with automobile traffic; this “interested but concerned” demographic represents 60 percent of Portland’s population; (3) those who are already riding in Portland, because of Portland’s efforts at improving bike infrastructure, despite the incomplete status of much of Portland’s bike infrastructure; this “enthused and confident” demographic represents 7 percent of the population; and (4) those riders who are “strong and fearless” and would feel comfortable riding in (and may even prefer) a complete lack of infrastructure; this demographic represents less than .5 percent of Portland’s population. One obvious takeaway from these stats: Those willing to ride in the absence of infrastructure are already doing so. A related lesson is that if we want to get more people on bikes, we have to build the infrastructure that will help them feel safer while riding. As the great cycling cities of Europe have learned, when bicycling feels safe for children and the elderly, everybody feels safer, and more people ride—and that is a benefit for all cyclists, and others as well, since as the roads become safer for cyclists, there’s also less danger for both motorists and pedestrians. Even with a tiny minority of Portland’s citizenry on bikes, the town is known world-wide as an epicenter of American cycling. Imagine the look and feel of Portland with not merely 7 percent (the current figure), but 67 percent of its population on bikes, for at least some trips. Think, too, about other North American cities became serious about achieving those kind of numbers. That’s the idea behind building bicycle infrastructure. Of course, “bicycle infrastructure” means bike lanes —the infrastructure most people are familiar with—but it also means other types of infrastructure. Cycletracks, (physically separated bike lanes), for example. It also means secure bike parking —nobody is going to ride to a destination if there’s no secure bike parking once he or she arrives. And it means bicycle boulevards, and sharrows. Now, maybe we’ve heard these terms bandied about before, but what exactly is a bicycle boulevard? What is a sharrow? And how do they differ? A bicycle boulevard is a street that, due to low traffic volumes, has been designated as a street that prioritizes bicycles. This priority is indicated by symbols painted on the pavement, apprising drivers and cyclists alike that the street is prioritized for use by cyclists. On a bicycle boulevard, the infrastructure advises cyclists that they are expected to take the full lane, and advises motorists that they should expect to see cyclists and to therefore “travel with caution” (although really, shouldn’t motorists always be traveling “with caution”?) and to share the lane. For cities, one benefit of creating bicycle boulevards is that they can be created at relatively little effort or expense. There’s no need to figure out how to squeeze additional infrastructure onto existing road space; the city merely needs to identify which streets meet the criteria, and paint markings. A sharrow is a somewhat similar concept: a road that is converted into a sharrow has a special “sharrow symbol ” painted on to the road surface eleven feet from the curb (or four feet from cars parked curbside); these symbols indicate that cyclists may ride to the left of the door zone, and apprise motorists of that fact, and that they should expect to encounter cyclists and to share the lane with them. Sharrows are used instead of bike lanes when the road is too narrow to accommodate a bike lane. The main differences between a sharrow and a bicycle boulevard is that traffic volumes will be higher on sharrows, and there’s more ambiguity about where the cyclist should ride (Center of the sharrow arrow? Center of the lane?) than there is on a bike boulevard. Despite the step in the right direction these infrastructure improvements make, there’s still room for improvement. For example, Portland’s first generation bike boulevards are identified by small circular road surface symbols. These symbols, about a foot in diameter, don’t really provide enough visual cue to drivers to alert them to the fact that they are driving on a bicycle boulevard (and thus, to expect cyclists and to exercise caution). This lack of conspicuousness is further exacerbated by the worn and weathered appearance of the symbols. That’s not the only problem. Although the streets with these bike boulevard markers met the criteria for selection—mainly, streets with low traffic volume that still provide connectivity to the rest of the system—the bike-friendliness of at least some of these first-generation bike boulevards is undermined by the presence of stop signs every two blocks. Now, it’s not as if the city laid out a bike boulevard, and then placed stop signs along the route; the stop signs were extant when the boulevard was created. Still, while stop signs are probably desirable in terms of slowing cars down on these streets (and possibly even encouraging drivers to choose other streets), the ubiquitous nature of the stop signs raises the question of whether a bike boulevard requiring lots of stops is truly “bike-friendly.” One easy solution to this contradiction would be to allow cyclists riding on bicycle boulevards to treat stop signs as yield signs, whether by changing the law, or by adding “Bicyclists Yield” signs to existing stop signs along these boulevards. 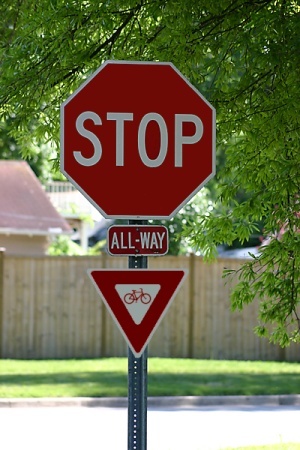 These quick-fixes aside, the incongruity of a stop-sign laden bike boulevard is indicative of the limitations inherent in adding a bicycle boulevard designation as an overlay to existing streets. Although Portland has not addressed this contradiction directly, the city is in the process of rolling out its next generation of bicycle boulevards. With its first generation of bicycle boulevards, Portland carved out some bicycle infrastructure with relative ease. Portland’s new generation of boulevards will truly prioritize non-motorized traffic bycomprehensively redesigning infrastructure to meet the needs of cyclists (and pedestrians). Regardless of whether bicycle boulevards take the form of roads with simple visual cues instructing motorists that they must share the lane with cyclists, or whether they are comprehensively re-designed to prioritize cyclists and pedestrian traffic, the common thread they share is that road space that has previously prioritized—and been dominated by—motorized traffic is now being reclaimed and re-prioritized for non-motorized traffic. Where this infrastructure has been created, motorists, previously accustomed to bullying cyclists and pedestrians off of “their roads,” are now being apprised to expect cyclists in the lane, and that the law requires them to share the road with cyclists and other non-motorized traffic. The road is no longer just “their road”—and with the new generation of bicycle boulevards, the road design itself prioritizes cyclists and pedestrians. Portland is not alone in reclaiming its streets from the dominance of motorized traffic; once automobile-dominated cities across the country—from New York to Detroit to Los Angeles —are re-thinking their infrastructure and public spaces as a convergence of looming environmental disaster, continuing economic crisis, and a rising epidemic of obesity have resulted in a nationwide (and indeed, global) groundswell of interest in cycling and livable streets. And that groundswell of people who are cycling is just the visible tip of a much greater groundswell of interest in cycling that is not being accommodated by our current automobile-oriented and automobile-dominated infrastructure. As Portland’s research has shown, most people in Portland do not currently ride a bike because they have fears about riding in automobile traffic—but these same people are interested in riding, and would ride if they felt safe. And as European experience has shown, addressing this concern about safety is the key to getting more people on bikes. When cycling feels safe for everybody, from young children to the elderly, more people ride, and when more people ride, the roads transform from feeling safe to being safe—and not just for cyclists, but for everybody. This is the wave of the future, and as more cities across the country begin to understand this, we will see increasing attention paid to addressing this unmet need—and one of the easiest ways cities can provide the safe road space people need and want is through the creation of sharrows and bicycle boulevards. This article, Adding Bicycle Infrastructure Creates More Riders, was originally published on Bicyclingon July 7, 2010.